Inspector Jaime is haunted by his own past which is dragged out of the shadows by the disappearance of a body from the morgue. On the case, Jaime must investigate how a corpse can vanish from its freezer without a trace, the only witness being a guard left in a coma cause by indescribable fear. With his own nightmares driving him to despair, Jaime’s only suspect is the dead body’s widower, Alex, who maintains his innocence but struggles with inner demons that won’t remain hidden. With a body on the loose and strange phenomena occurring, Jaime and Alex are intertwined in a horror that will leave you cold (that's the PR company's joke, not mine). Directed by Oriol Paulo, The Body / El cuerpo gained strong reviews when it screened at last year’s London Film Festival and stars Belen Rueda (The Orphanage) as the titular Body. Paulo is best known for his writing duties on the critically acclaimed Julia's Eyes (2010) but here makes his feature-length directorial debut which firmly places him as one to watch. 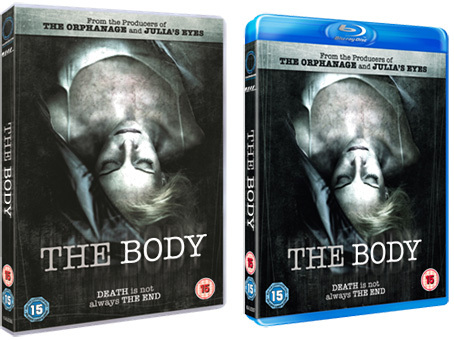 The Body will be released on UK DVD and Blu-ray on 9th September by Kaleidoscope Home Entertainment at the RRP of £15.99 for the DVD and £17.99 for the Blu-ray.